We are proud to share this article featuring our talented chef, Jeff Ross. Jeff recently traveled to Vriendschap Village, our sister community in Pella, Iowa, to share his years of knowledge and expertise, as well as demonstrate methods to prepare foods consistent with Thrive Dining™. 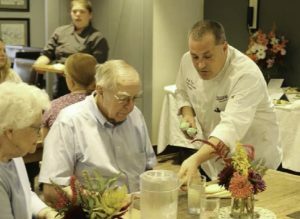 “Thrive Dining turns traditional meals into finger foods, adding dignity to the diets of people who live with swallowing difficulties, Parkinson’s Disease, dementia and other conditions,” Jeff explained. We are very lucky to have Jeff here at East Village Place; his passion for cooking and dedication to going above and beyond to satisfy our residents is truly inspiring. “I was really honored to be selected to travel someplace new and share what I’m passionate about in order to enhance the dining experience for another community,” Jeff said. He has received several awards during his four years at Watermark including multiple Thrive Awards, Breakthrough Awards, and an award for Standards Achievement. To read more about Jeff’s time at Vriendschap Village, check out the attached article featured in the Pella Chronicle.